I’m a new blogger. 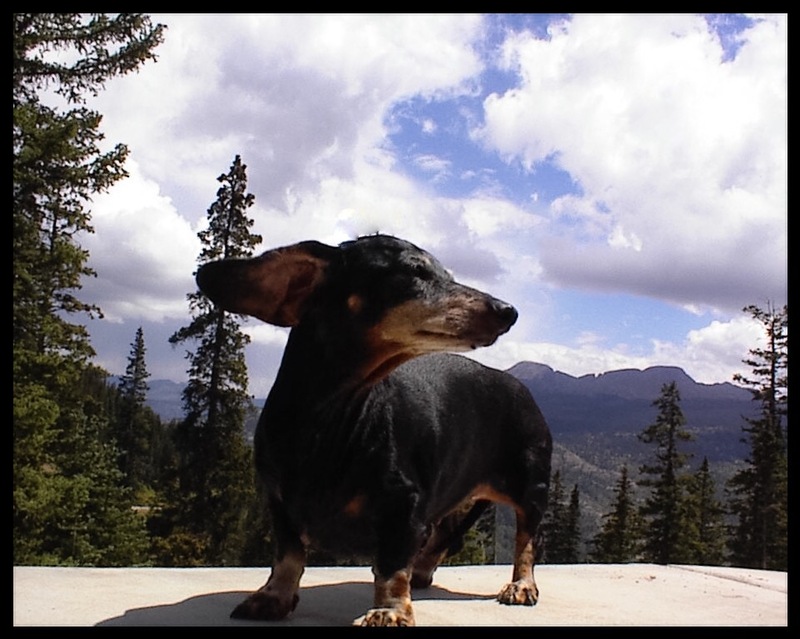 I hope to use this blog to inform dog lovers of our mission here at The Promised Land Dachshund Sanctuary. This picture is Christy Vaughn Eicher V. She is the reason we rescue Dachshunds. 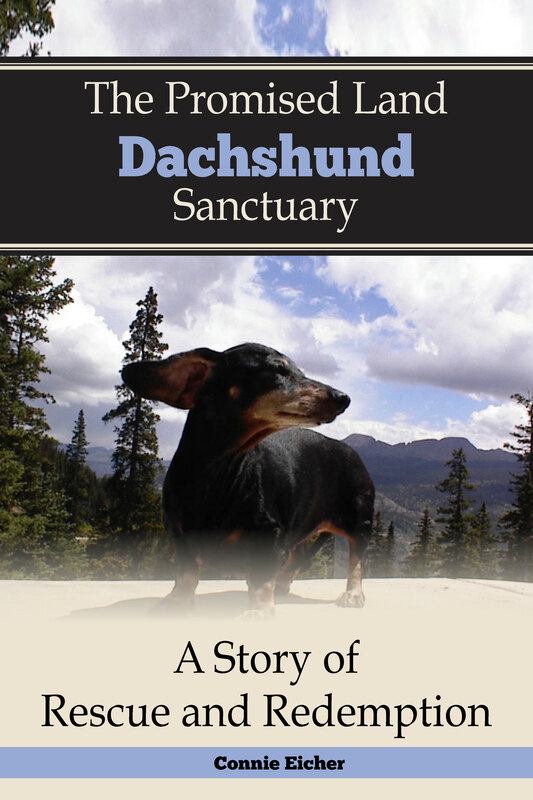 You can donate to the sanctuary or purchase our book, “The Promised Land Dachshund Sanctuary” by mail or money order to The Promised Land Dachshund Sanctuary, PO Box 826, Gardendale, TX 79758. Or you can use your credit or debit card with the link on this page. The E-book is also available now and you can purchase it through Amazon with the link on this page. The book is $14.95 + $5.00 shipping and packaging. E-Book is $9.95. Earlier this week I read an article written by a prominent veterinarian concerning his desire to do something about the over-population of dogs in America. His theory is based on a very valid need in our society to persuade dog owners to spay or neuter their dogs. This hypothesis brings to mind many facets of the situation including backyard breeders, puppy mills, and the growing population in our country that make their living by selling “high quality” puppies. But the point that struck me as simple minded about his article was that he feels that rescues are wasting the money that Americans generously donate to help with the mission of rescue. He believes that every penny aimed at doing something about our over-population of dogs should instead go to spay and neuter. While I don’t disagree with the obvious fact that we as a society have got to stop producing more dogs, I believe his axiom is severely flawed. I know there are a few states that are imposing fines (in the form of higher registration costs) on pet owners that do not spay or neuter their animals. From my point of view as a rescuer with almost 20 years experience, I cannot see that these laws are changing our problem at all. In Texas, the law states that breeders must be licensed and inspected on a regular basis. Because of the lack of revenue and the emphasis of using those resources to fight criminal activity that far outweighs having a litter of pups every few months, those laws are basically useless, and certainly ignored in far too many communities. So if laws to control overbreeding don’t work, then what alternative is worth pursuing? What will stop the massive amount of senior dogs that end up in our shelters every year because their senior owners passed away or had to go into an assisted care facility? What will stop the breeding of a family’s pet because they simply must have an offspring of that individual dog? What will stop the immoral and massive abandonment of dogs that no longer fit in with the families’ life style? Is there a simple answer to all of these situations? Education is one answer that SHOULD certainly help curb the activities that fill our shelters with beautiful, intelligent, and loving dogs. Rescue groups pride themselves with the education of the public about our teeming shelters. Our sanctuary certainly makes concerted efforts to educate about the fate of senior and special needs dogs that are left to fall thru the cracks of the rescue safety net. When I did an internet search of the rescue groups in Texas my computer timed out before it could load the enormous list! Texas has one of the worst canine over-population problems in the country. It is certainly not caused by a lack of compassionate rescuers that give their entire lives to the care of the “disposable” dogs in our state, and to the massive imperative of educating the public. Perhaps this phenomenon of the colossal efforts put forth by rescue groups is part of the reason this particular veterinarian believes we waste our money by supporting these endeavors. If he is indeed correct, what would happen if we all suddenly stopped rescuing and used all of our donations to just spay and neuter every dog we could get our hands on? The theory is that eventually we would have our dog population under control. But at what cost? The pressure put on our animal shelters from animal activists have persuaded many institutions that are supposed to be havens for our homeless or temporarily misplaced babies to become No Kill. What that really means is that those shelters turn down the dogs that are hardest to adopt. They turn down the seniors. They turn down the special needs babies. They turn down certain breeds that are difficult to re-home. At some point they have to close to intake completely. So what happens to the dogs they turn away? We have a local Humane Society shelter that is No Kill. They turn down dogs everyday. Those dogs end up in our county shelter that has to euthanize up to 30 dogs a day to keep their facility from overflowing with discarded pets. Our sanctuary, just like all rescue groups is No Kill. What happens when we turn down a dog because we have been surpassing our capacity for over a year? They end up on the streets or in the local shelter, or at the very least they end up in someone’s back yard who has no desire to care for the animal. They are basically abandoned to their fate. Is this the price we must pay for neglecting these precious lives that God has gifted to us? Is this the best we can do for these loving souls that depend on us to protect and care for them? Is this the final result of our fast paced society that values their new car or their fancy computer more than the four legged creatures that love us more than they love themselves? I would bet everything I own that if the vet that wrote that article were to spend two hours here at the sanctuary loving on and getting to know my babies, he would rethink his ultimate answer to the devastating situation we have created as a society. I would bet he would realize very quickly that the money we spend to care for the old, the time we spend loving on the ill, the efforts we make to provide for the forsaken would not, COULD NOT be classified as throwing good money after bad! Author thepromisedlanddachshundsanctuaryPosted on March 7, 2019 March 8, 2019 3 Comments on Good Money After Bad? As a young mother I had many of the same worries that we each have when we begin to raise a family. One of my main concerns was did I have what it would take to raise a disabled child. I feared I would fall short of the necessary skills to help a child of special needs meet their goals and live a happy life. God blessed me with two healthy children, and I am grateful each and every day that I was not faced with the challenge of raising a child that had extra obstacles to conquer. But when we began to rescue senior and special needs Dachshunds my ability to help these priceless creatures placed in my care was challenged every day. I learned very quickly to take each day as it comes. I tried not to worry so much about the long-term outlook but to concentrate on what I could do for my babies today. Xera (blind and deaf double dapple) provided the first real test of my abilities to deal with afflictions that were life altering for her. She came to us from a background where her inabilities proved more than the former owners could overcome. Those of you who have read my book will recall the harrowing first twenty-four hours where my endeavors failed to comfort her. But as time passed, and we began to get to know this little spit-fire, our practices began to produce positive outcomes for her life. We taught her to go thru the doggie door by blowing on her thru the opening. Once she realized she could push that flap up there was no keeping her inside. Soon after that we discovered her love of plastic bottles. Before long she could run full force toward the doggie door with a gallon jug in her mouth and clear both sides of the opening as she took her new toy out to play. Xera’s nose took the place of her eyes and once we began to contour our reactions to her needs by her olfactory prowess, we found very few things that we could not teach her. Her deafness was much more of an obstacle, and even after she had been with us for years I would still once in awhile call her out to stop an undesirable activity. Most of our special needs babies that are deaf did not live their entire lives with this affliction. Most of them could tell when we spoke to them thru the eye contact. Because Xera could not respond to the eye contact with us, many situations with her depended on physical touch. The lessons we learned from her helped to prepare us for the many challenges we were to face with other disabled babies. Lexi came to us as a senior who had already lost her vision. Once she realized that her name was Lexi she responded quickly to our vocal commands. We had no way of knowing how long Lexi had been without her sight, but we soon discovered that her intellectual capacity is exceptional. She learned where the doggie door is by listening to the other babies use it. She learned when it was time to eat by the excitement and noise from the rest of the pack. Teaching Lexi has been a breeze. But many of the babies I am asked to give advice for have just recently lost their sight, and some will no doubt try to shut down. They fear what was once familiar. That trepidation often causes inactivity to a level that is detrimental to their overall physical and emotional health. As doggie parents we try to compensate for the loss of one of our babies’ senses by doing more for them. We carry them more, we make sure that nothing is ever out of place for them, and we try to keep them from any situation that might expose them to difficulty. We take away the bewilderment, the contemplation, the need to study and discover new aspects of their lives. Let’s stop and think for a minute what makes our healthy dogs happy. They love new sounds to bark at, they love new smells to sniff, they love new textures to roll in, and they love new environments with clues to the past that only they can decipher. When the variety of their lives is absent, their desire to live wanes. Bottom line is you have to work a little harder to fill their days with contrast. They will discover that the thrill of detection is still present in their world. They will unearth new reasons to be excited by their environment. They will learn that they have not lost their ability to be happy, active, and fulfilled. The old adage that a tired dog is a happy dog is so very true, and it especially applies to one who has suffered the loss of their eyesight. By adding variety to their lives we will see that their happiness truly will be an inside job. Each month I receive dozens of emails and messages from followers who are worried about their senior babies. Some of those questions are way above my pay grade, and I simply refer them to their vet. Others are common questions that I have answered many times over the years. My experience with so many senior and special needs babies over the years often comes in handy. I can talk at great length about getting an ill dog to eat, or teaching a blind dog how to deal with their world. But one question that I struggle to answer concerns the grief process we all go thru when one of our babies takes their final trip over the bridge. Since we first opened the sanctuary in the summer of 2001 we have lost several hundred babies to a multitude of maladies. Most conditions that affect our silver faced loved ones are familiar to me. I always try to make people understand that there is no substitute for an excellent vet, and we have certainly been blessed in that area. But I am willing and honored to share my experiences with anyone that is searching for answers. One question that I am most commonly asked is, “How do I get over the loss of one of my precious babies?” The answer to that is most often the same. I tell everyone that for us, with as many little ones that depend on us each day, we don’t have time for an extended period of grief. Our babies need us to be on top of our game each and every day. Sometimes, however, that is harder than others. The heartfelt answer to that question is personal. By personal I mean that each of us deals with grief in a variety of ways. Growing up my mother always believed that the best way to deal with that grief is to get another baby right away. She would say, “Have a place for your love to flow.” I lived most of my life with that as my standard. Rick, on the other hand, needed more time in our early years together to process his feelings before he could even consider getting another dog. Our situation now is very unique in that babies come to us on a regular basis and we can’t wait till our hearts have healed to bring another family member into our home. We often fall in love with our new babies from a picture taken in a shelter or in a previous home. We love them before we ever hold them. What a blessing it is that each of our furry friends brings enough love with them to fill our hearts. There is never a break in the cycle of love when you care for as many babies as we do. Much of the time our grief is quickly quenched by the love of another dog that needs us. This is not the answer, however, for everyone who deals with the same loss. I would never say that I love any of our babies more than another. But I am honest enough to say that some babies, for many reasons, fill a larger spot in our hearts. Part of that reality is that the baby that needs us the most is the one that gets the most. So when a younger healthy dog comes into our lives it is not difficult for us to let them go on to their forever home. We fulfill the mission to alter their lives rather quickly. But when a special baby like Trooper comes into our lives, we spend days, months and sometimes years watching every meal, every action, every sign of change, and every dose of medication. At this point I can’t imagine another “Trooper” coming into our lives. Trooper needed us more than any other baby we have ever rescued. And immediately our entire world of friends and followers fell in love with him just like we did. The grief from that loss does not go away. It changes from day to day, but it never fully leaves our hearts. Some days it weighs us down, other days it holds us up. The morning our sweet little man took his last breath will never leave me. But neither will the first time I saw him bark at the top of his lungs for his dinner. His front feet bounced off the ground, and he got louder and louder with each burst of his gruff, old-man voice. The first time he stood between my feet with his nose resting on my shoes while I washed dishes produced a feeling in my heart that is still there. I feel the comfort he felt at knowing I was so close. I feel the satisfaction of doing everything in my power to meet his needs. I feel his gratitude for being safe and cared for. I still feel all of those things. So Trooper is not gone. He no longer needs insulin shots, or a special diet, or a watchful eye over his every move. What he does need is for me to continue to be the same person that held him that first day when he was so weak, the same person that held him and relished the soft whisper of his breath when he was at the top of his game healthwise, and the same person that held him that last day when the feeling of my arms holding him close was ALL he needed. For anyone who loves and loses a special friend and family member I have a very important message that comes from my heart. Be the person after they are gone that you were when they were with you. You all know that is what they would want. They desperately needed for you to be happy and healthy while they were with you. The tables turn when they leave us though. Then it is about what we need. And that is certainly different for us all. I believe that we require a period of grief, whether that is long or short is not the point. But I strongly believe that we do our babys’ memories an injustice if we don’t eventually move forward with our lives. We don’t replace our lost friends, but we give ourselves a place for the love to flow. That, in my opinion, is Good Grief. Because our canine babies can’t actually speak to us, we read their body language, their tail wags, the way they hold their heads, and the messages that come from their eyes. Over the years we have seen happy eyes, sad eyes, angry eyes, fearful eyes, shameful eyes, and exhausted eyes. Sometimes we see the entire spectrum of emotional eyes in the same baby. Andre’ was our first official rescue and as you can see in the pic on the right above, his eyes were sad and fearful when he first arrived off the streets. His body told the story of neglect, and his eyes reflected the angst that consumed him. After a few short weeks of care and attention, Andre’s eyes glowed with love and happiness. He blossomed physically and recovered quickly from the anxiety that sought to destroy his self-esteem. Andre’ was our Alpha Male for over 14 years and his eyes were proud, clear, and playful throughout his life with us. Very soon after we opened the sanctuary I have found myself in different shelters all over the state. Most of the eyes that look back at me from their concrete stalls are conspicuously full of fear. But they also manifest a deep and oppressing shame. That look haunts me in my dreams as there is no justification for dishonor from these creatures of God that had no control over their situation. We all know that the breed we dearly love is a proud breed. We’ve all seen our Dachshund babies hold their heads high and look at the world as if they are completely in charge. That extreme expression of pride in their eyes tells us they are happy and secure. But when they are subjected to the horrors of street life or the panic-stricken sounds of the constant barking and crying from shelter dogs, their pride is replaced with a denigration that tears at the hearts of all of us who would love each and every one of them if we could. Occasionally, we rescue a dog that comes from an abusive situation. Those babies that have not been allowed to activate their flight response from abuse, turn to the ardent aggression that is their last resort. Their eyes are distended and glassy. They watch for any opportunity to strike out at anything and everything as their confusion disallows any realization that they are finally safe. These unfortunate souls, that need love the most, are often the last to receive the tenderness and sympathy that is their only saving grace. As humans we also activate a fight or flight mode and when confronted with a snarling, snapping canine we are predisposed to escape. Most of these dogs are condemned to never leave the shelters alive as there are never enough avenues for their rescue and rehabilitation. I have personally received a very special gift from having watched Rick take several of these ostracized babies and turn them into the loving, cuddly, sweet babies that they were meant to be. Because we rescue so many seniors we see earth shattering grief in their eyes more than the emotions that can control the younger babies. Our old babies have lived long enough to put aside any predisposition for overwhelming fear or aggression. They have the wisdom to forgo the shame or helplessness we see in the shelter babies. But they know grief. They walk hand in hand with sorrow. Their heartache devours their every movement. They are broken, and sadly they often accept that state of mind as their final destiny. These eyes are the ones that carry a heavy burden of a lifetime of experience. These eyes will never emanate playfulness or hubris. But what they can achieve over time is a dedicated look of eternal love and greatfulness that fills our hearts with joy. Another result of our dedication to rescuing the old and the ill is the exhaustion in the eyes of a baby that has struggled long enough. Rick and I, along with the expert guidance of a dedicated vet give everything we can to these senior citizens. When the look of weariness and debilitation cannot be corrected, we make the hardest decision we are ever faced with in the care of these fragile beings. We take away their pain and illness through the only avenue left to us at that point as we hold them when they take their final breath. How totally blessed we have been to watch the eyes of countless rescue babies change with time. Love, acceptance, tenderness, and care always triumph. Obviously, some recover more than others. A few babies will hold on to their pain longer than others. But with very few exceptions, we have experienced the joyful transformation that we seek in the eyes of the babies we so dearly love. Their eyes always tell us what they need. Their eyes always reflect what they receive. Their eyes allow us to listen to their hearts and look into the mirrors of their precious souls. It is obvious from our enjoyment of social media that we all like to talk to each other about our families. Many of us have furbabies that make up a large part of our family, and we love to talk to each other about them. I receive dozens of emails and messages each week from people that want to share their experiences with their dogs. I love reading all the different descriptions and tales of their babies’ adventures and misadventures. But I have also been in the company of some people who roll their eyes a bit when I begin to talk about my vast family of fur babies. They give me the “It’s only a dog look.” I’m sure you have all experienced that look. Whether we are talking about their funny traits, their illnesses, their devotion, or the incredible loss when they cross the bridge, some people just do not understand. So we gather together on social media, and we all talk about our little ones with a passion that is well understood by our peers. I spend many hours each week talking about my babies online. Most of my conversations center around adoptions, new babies, vet treatments, transports, and the joy of watching a new baby learn to love and live again. Often I feel as if I miss out on the joy of talking about the little things that make us love our babies. There is, after all, only so much time in a day. At the end of each day here at the sanctuary Rick and I spend at least an hour just sitting with the babies and talking about who ate well and who didn’t, who seems to be feeling better, who doesn’t feel well, and who needs to go to the vet next. That conversation can be quite complicated with the large number of babies we care for. But at the end of those conversations the subject turns to the lighter side of our lives, and we laugh and talk about our babies’ little quirks. Those individual traits, along with the similarities we all see, are what roll around in my head at night when I lay down to rest. I often wonder how could I ever completely educate someone about our babies. How could I make another person understand the needs and particular desires of each of these special little souls? Of course, the answer is that I could never truly educate another person about our babies. You have to live with them each day, love them each day, feed them each day, and revel in their joys each day to know them well. So today I have done the next best thing; the thing that we all love to do. Today, I’m talking about our family and how incredibly wonderful they all are. I wish you could all stand at my bathroom door and watch Lady Bug bark at herself in our full length mirror. I wish you could watch Rowdy lay down on a pile of paper towels after he has shredded them and gotten caught. I wish you could all watch Higgins chase the shadows of birds across our lawn and throw his head back and howl when the shadow crosses the fence. I wish you could all feel the joy when Waco manages to get his arthritic back legs out the doggie door. I wish you could all watch our barn dogs waiting for their turn to jump in the water trough just after it has been filled with fresh cool water. I wish you could all watch the pride in Ace’s face when he chases Mr. Gibbs all the way to the bathroom door where Mr. Gibbs eats his eggs at night. I wish you could all see Lexi stand so very patiently at night for me to find her an empty bed and cover her up with a fresh blanket. I wish you could all watch Ziggy scratch at the bottom of the crate when he is waiting on his lunch. I wish you could all watch Trooper stand between my ankles when I cook or clean in my kitchen. I wish you could all watch Pumpkin claim the big bed directly in front of the wood stove in the Doggie Room on a cold night. I wish you could see all the grass on Baby Jade’s back after she has rolled in the warm sunshine. I wish you could watch Christy stand on the edge of my bed and bark and fuss at Gena who is laying on the floor with half of her big body tucked up under the bed. I wish you could watch Delilah fly off the bed, only touching one of the stairs there for her benefit, when she hears Rick come thru the front door. I wish you could see Little Bit standing at the end of Rick’s bed, waiting patiently for him to fix her a special spot, while the dozen or so other dogs on the bed claim their place. I wish you could watch Jake walk so very slowly down the hall when he knows I’m trying to get around him. I wish you could hear Zoe barking at me like I’m a total stranger two minutes after I return to the kitchen. I wish you could see Beth stand on top of a cart filled with 300 pounds of horse feed as Rick pushes it to the check out at the feed store. I wish you could watch Gilbert growl while he leans into Rick to get more lovin. I wish you could hear the sweet sound of slumber when a dozen dogs are curled up on Rick’s bed in the evening after their turn for belly rubs. I wish you could see how high Winston can jump when Rick throws a little snack of kibble to the Kitchen pack. I wish you could see Dexter get the zoomies right before I feed him his dinner. I wish you could watch Maddie maneuver a balled up blanket into a perfectly placed cover over her entire body. I wish you could walk thru the sanctuary with me at 1am when I make my final walk thru to cover up the babies. I’m just saying…. Last week while listening to a local radio broadcast of the news the announcer very casually mentioned that our local animal shelter euthanizes 20-30 dogs every day!! EVERY DAY!! I turned off the radio to let my mind absorb what I had just heard. I reached for a calulator and multiplied 52 weeks in a year, 5 work days per week, and an average of 25 dogs per day, and the number made me cry. 6500 dogs this year will lose their lives in Ector County, Texas. We have a population of just over 100,000 people that is growing every day as the oil field booms. That’s one dog for every 15 people. I read comments every day from people who say every shelter should be No Kill. What do we as a society expect these shelters to do with 25 dogs over their capacity each and every day? One of our local shelters has just received the go ahead to built a new larger facility. How long will it take to fill up that new facility with 25 dogs a day coming in. Maybe a week if we are lucky. I was in this shelter last week picking up a 9 year old that had been turned in by her lifelong owner for having diarrhea. It took about 30 minutes to fill out all the paperwork for me to rescue this little doll. While I was there 4 dogs came thru the front door to MEET THEIR FATE. A discussion about what can be done to curb this horrific situation almost always leads back to more government regulation. I’m all for laws governing the breeding of dogs. I’m all for laws to try to force people to spay and neuter their pets. But from my experience those laws are almost futile. In Texas, commercial breeders are required to get a license. They are also required to open their doors to quarterly inspections. Those inspections don’t happen. Many back yard breeders say, “Well we are only having one or two litters a year, so it is more of a hobby than a business.” Our government cannot go house to house to insure that all dogs are altered. They cannot keep up with the demands on their time as it is. No way they can enforce more laws to prevent the over population of dogs. Ok maybe we need more rescuers. We have four layers of rescue in our society. The top layer is made up of organized rescues that vet their applications with strict standards. The next layer is also comprised of organized rescues that set up at Petsmart and other facilities and events for adoption days. Then we have the shelters and Humane Societies that adopt dogs from their facilities. And last we have the dogs that are lucky enough to get pulled off the street by a caring individual. All of these people are doing EVERYTHING in their power to save as many dogs as possible, and they all suffer through one horrible situation after another. Shelter workers often take a beating in the public view. Would you do their job? I certainly wouldn’t. Most of these people are there because of their love for the animals, but turnover in these jobs is tremendous, and I can certainly understand why. As many of you are aware we are currently caring for 58 dogs. In the last week we have had three adopted and four new ones came in. We are 18 dogs over our capacity and each day we struggle to get to the end of the chores. We are desperately trying to raise the funds needed to build a separate facility on our land that will be able to handle 100 dogs. During the month of May I have turned down 14 dogs that needed a soft spot to land. At that rate and considering the increase in our local population how long will it take us to fill up our new facility? Not long, not very long at all. Last night Rick and I had a long conversation about the tiny, little dent we make in the problem. We are well aware that we cannot save them all, we can’t even save a small percentage. Our only saving grace is that as we look around at all the babies curled up beside us and in numerous dog beds all over the floor, we know that our efforts made a huge difference to those babies. And that knowledge is enough to make us get back up each morning and do the very best we can for the ones that depend on us. So where does that leave us? There is only one solution that I can see. We must have an army that is huge, that is resolute, that is self-sacrificing, that is relentless. THAT ARMY IS YOU! You are the only way this problem ever gets reduced. You must rescue one more than you think you can handle. You must encourage everyone you know to care for their babies for the entire life of that baby. You must encourage anyone you know that breeds their dogs even one time, to STOP! You must push the AKC to change their standards for show dogs that must be intact. You must volunteer at your local shelter or humane society. You must pass on a kind word to the workers in your local shelter. You must make your social media posts about the positive things we can do and not about the horrible things that we all see everyday. You must not spend one ounce of your energy trashing the people who give up their dogs, because you will not change who they are. You must stop giving animal abusers the spotlight as we all know they are there. You must raise your children to know that a pet is for life. You must show your neighbors that there are people who will help them if they are struggling to care for their pets. You must encourage the seniors among us to plan for the care of their babies if they become incapable of doing it for themselves. You must stop valuing puppies over adult dogs, You must protest your local pet stores that sell puppies from puppy mills. You must transport for your local rescues. You must foster for your local rescues. You must offer to pay for spay/neuter for young couples that are struggling to make ends meet. You must walk thru your local shelter often enough to remember that those sad faces behind those fences have no options. You are their only option. You are their only advocate. You are their only chance to know the love of a human like they deserve. Ok so now my rant is over. I realize that no one can do everything on that list. Rick and I don’t do everything on that list. But we must all do something more than what we are currently doing. Because from my point of view that is the only hope for the millions of babies that will lose their lives this year to the tragedy that we as humans have created. Beauty is something we all crave. We want beautiful spouses, beautiful children, beautiful homes, beautiful cars, and beautiful clothes. We travel to see beautiful scenery. We pray for beautiful weather, and we are attracted to beautiful friends. Everything around us promotes our desire for beauty. The movies, television, newspapers, magazines, and books that we consume revel in beauty. Ads for clothes, makeup, hairstyles, and even toothpaste tell us we need to strive for as much beauty as we can get. Our dictionaries define beauty as prime, choice, winning, advantage, strength, benefit, and fascinating. Because of this accepted definition beautiful people are allowed many benefits in our society. They often get the best jobs, the preeminent opportunities, and the utmost recognition. Most of us would agree that this value system is both unfair and unfortunate. But we are programmed to accept it because it seems familiar and ironically justified. This yardstick also applies to our choice of pets. At the sanctuary, because we rescue mostly senior and special needs dogs, we don’t get that many beautiful dogs, if they are judged by the normal standards of society. When we do rescue a beautiful, healthy dog our Facebook page explodes with hundreds of shares, hundreds of comments, and thousands of likes. These babies are not only adopted quickly but we generally have multiple approved applications to choose from. We would not deny these babies the attention they receive. We are thrilled when any of our babies find a wonderful forever home. But while we are like everyone else that is instantly attracted to the beautiful, healthy, and young babies, we have also been blessed with the opportunity to see beyond the gorgeous coats, the clear eyes, and the spry attitudes. We spend most of our lives with the silver faces, the crooked mouths, the chewed up ears, the cloudy eyes, and the arthritic legs. As we get to know each of our new residents we discover the wisdom behind those cloudy eyes, the calm acceptance in those silver faces, the tenacity in those chewed up ears, and the life experience in the roads traveled by those arthritic legs. We see unmatched devotion in the blind dog that stands between our ankles when we cook. We see the perfect patience in the arthritic dog that struggles to cross the sometimes slippery tile floor. We see the persistence in the weak dog that tries over and over to maneuver through the doggie door. We see the excitement in the deaf baby that realizes when our eyes meet that we are talking to him. We are forever blessed by the enlightenment these old babies bring to our lives, and their courage helps us to face our daily struggles with a little less self-possessed sympathy. We enjoy the tranquility of cuddling up with a baby who doesn’t feel the need to jump up and run outside each time the wind blows a branch against the house. We delight in the commendable affirmation of an old baby that has just arrived and finds a warm reception when curling up next to others on a soft bed. Our eyes are opened to the real beauty in our world; the beauty that doesn’t judge, the beauty that doesn’t tease, the beauty that doesn’t envy. I’ve heard it said that adopting an older dog is a waste of money because they won’t live very long or their vet bills will be too high. How much is wisdom worth? How much is calm devotion worth in your life? How much is contentment and tranquility worth in this fast paced world we all live in? Don’t get me wrong. I’m not saying that senior dogs are perfect for every family. What I am saying is that they can bring things into our lives that we don’t always get from our world. I’m saying that the value of a companion cannot be measured with life span. I’m saying that the love of an old baby cannot be measured in dollars and cents, and I’m saying that beauty, when it comes to our babies is very much in the eyes of the beholder. To watch one Dachshund regain his strength and self-esteem rejuvenates our souls and reinforces our efforts. The Promised Land Dachshund Sanctuary Blog at WordPress.com.